I’m excited because I got a visit from the “marathon fairy” today. Okay, it was UPS, but they were bringing me goodies. 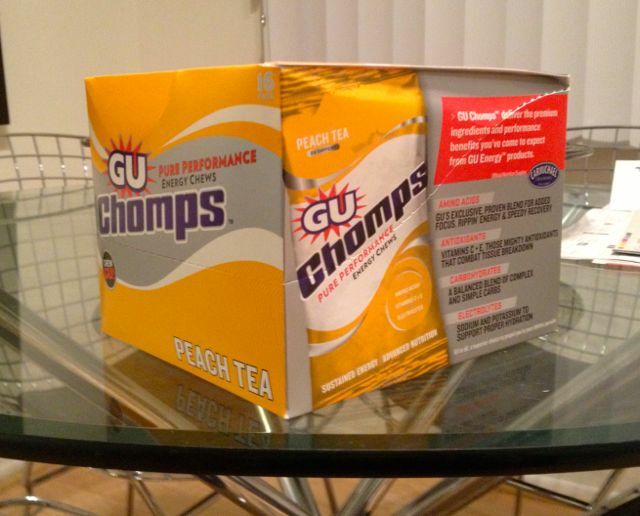 Inside the package was some running swag and a big box of GU Chomps that I’d ordered. The timing was great because I’d just used my last pack on Saturday and needed to re-supply. A human body in many ways is like a car and I’m not just talking about the exhaust pipe in the rear (cue the “rim shot”). If your car runs low on fuel when you drive, it starts sputtering, runs inefficiently and eventually stops. So will you, if you’re not careful. Cars use gasoline for fuel; for running we typically rely on the energy supplied by carbohydrates (often referred to as glycogen). And just like a car’s tank can only hold so much gas, the same holds true with us. Most runners can only store about 2 hours worth of glycogen at a time before the tank runs dry and we need more. Remember, if you don’t fuel, things get bad and you’re heading for an unwanted trip to the wall. NOTE: Any of the figures I give are what work for me. You’ll have to experiment to find your needs and tolerances. Talk to your running friends, coach or try different things out to see what works best… but NEVER experiment on race day. There are differing theories on how much or how often you should eat during a race/run, but experts all agree you need carbohydrates and you want to avoid your tank hitting empty. For me (again it may differ for you), I like to eat around 100-150 calories every 40-45 minutes. This applies to any run I do over 8 miles. When my running group T2 (Team To End AIDS) does our weekend runs, we’ve got the benefit of a support staff every few miles offering us a bevy of food to tempt our tummies. The hands down favorite is the “peanut butter crackers with pickles.” I know it sounds nasty, but it’s got everything your body craves (including much needed sodium) and near the end of a 17-mile training run it’s like crack. But as runners know, on race day you’re pretty much on your own and anything you want, you need to carry with you. When I first heard about the need to feed on runs years ago, I asked the veteran runners and my coach what I should try. The suggestions were many and varied. Let’s just say my menu changed for a good year or two before I zeroed in on my current chow of choice. 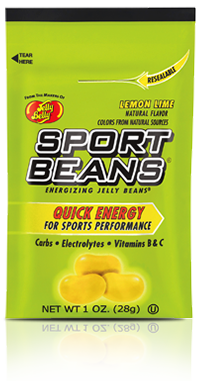 My first foray into running food was Sports Beans, by Jelly Belly (yes, the jelly bean guys). I loved the lemon/lime flavored ones (I felt they were like Gatorade nuggets). But when I went on really long runs I had to carry quite a bit and a mouthful of jelly beans wasn’t the easiest to eat and swallow (especially after 4 hours). And when things got cold those beans got rather crunchy. After that I switched to gels, those cake frosting/pudding-like packets. I found these worked well for a while and were far easier and faster to eat than sports beans. I particularly liked the chocolate, but due to hyponatremia I had a bad reaction during the 2010 LA Marathon and almost, how shall I say it… “spewed monkeys chunks.” Ever since that experience I haven’t been able to stomach going back to gels. Maybe someday. 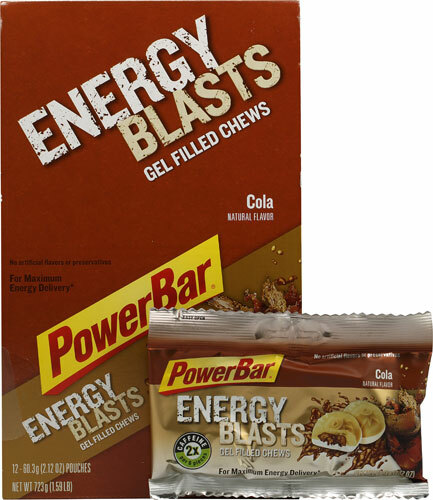 Next up were Power Bar Energy Blasts, specifically cola flavored. Just think of plain gum drops with a cola soda center… yummy. I really dug these, but Power Bar (for some reason) discontinued the flavor temporarily. So, I reluctantly moved on. The flavor has since come back, but sorry, I’m currently seeing other foods. Getting over the energy blasts setback, I thought I’d “give GU a go” (say that fast ten times). I went right for the GU Chomps. Think of ‘em as flavored jello bites. Not too chewy, not too “liquidy,” but just right. I’ve tried a variety of flavors, but have chosen the Peach Tea as my favorite. They taste good and the 2x caffeine boost doesn’t hurt either. And now I buy these by the box. 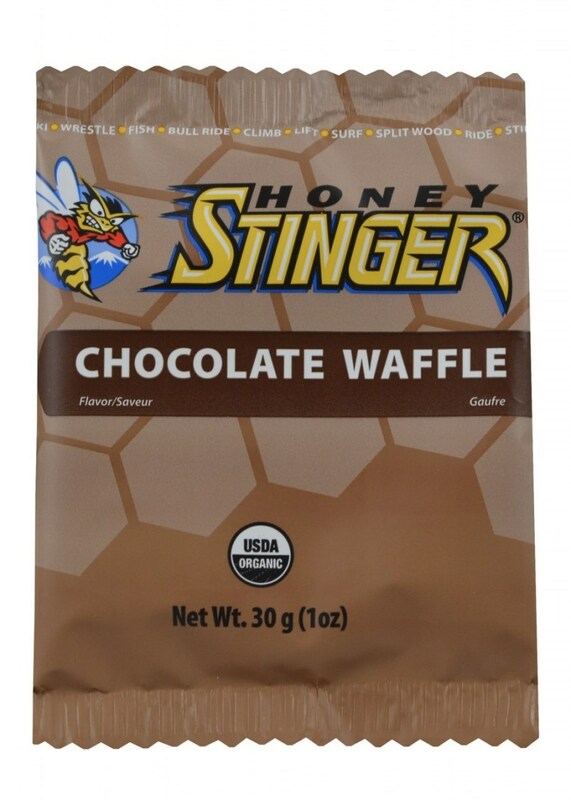 Another food that several of my friends use during runs is the Honey Stinger Waffle. I enjoy these as well, but typically use one as a pre-race carbo snack, chowing it down as I drive to a race. And there are plenty of other good products on the market. I also know friends who bring along nuts, pretzels or other types of food for a race. The main thing is to find what works for you. And then nobody goes hungry. NOTE: One final piece of advice. 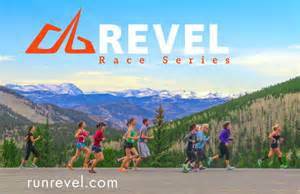 During many races companies will offer free samples of gels or shot blocks for runners to try (usually around mile 8 or 9 of a half marathon). Be sure to take one if you want, but put it in your pocket and save it for a later training run. As I said before, race day is NOT the time to experiment. Bon appetit… and Run on! 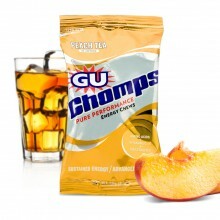 (Share with me your favorite running foods and flavors). Posted on January 8, 2014, in General, Training and tagged Bonking, Food, Gels, Glycogen, Gu Chomps, Hyponatremia, Sports Beans, Training, UPS. Bookmark the permalink. Comments Off on EATING ON THE GO.